In honor of Valentine’s Day (or in celebration of it passing with minimal collateral damage) I’d like to tell you a story of a great love shared by two top gunners. One half of the pair, is a southern belle who is as sweet as she is gorgeous. The other half, is a northerner come south, who I have heard called, “the Michael Jordan of the shooting sports.” Three years ago they met at the ranch of a mutual friend while relaxing and shot gunning the afternoon away. 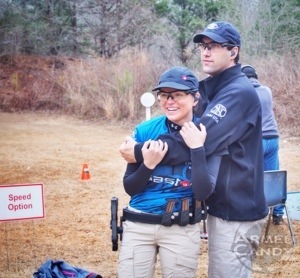 Until that point, our story’s heroine had not been involved with pistol shooting or competition shooting, but as they became friends they spent a good deal of time at the range together. Romance blossomed and a little over one year ago they became Mr. and Mrs. Sevigny. Not only are they a happily married couple who are planning their dream house, including a private shooting range, but they are also part of a big happy blended family. On the day we met at the Georgia Steel Chalange State Championships, I was not the only spectator following their squad. Brooke’s father and stepmother arrived soon after myself. Later her mother and half sister made an appearance as well. It was lovely to see Dave playfully dressing his young sister-in-law in his competition belt while Brooke explained how her race holster worked. Though some couples finding it refreshing to come home from an outside job to their significant other, Dave and Brooke spend ALL their time together. 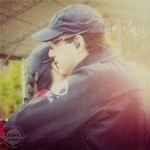 As members of team FNH USA, they shoot together and travel to appearances and trade shows as a pair. Having recently returned from Las Vegas for SHOT Show 2014, I even overheard Dave describe how they hit the blackjack tables together. They also represent their company, Sevigny Performance, selling and installing their own brand of pistol sights, once a match had commenced. Further, Dave serves as Brooke’s shooting coach, which has obviously paid off. She only began competing in 2011. However, Brooke is one of the leading female competitors in multiple shooting competitions. After a year of marriage and so much time spent together, I had ask if the relationship was losing any of its polish. Without hesitation or doubt, Dave said, “It’s still a honeymoon everyday.” In another conversation Brooke told me that Dave is simply, her best friend. congradulations you two , hope you have many more .